Recommended as one of the safest alternatives to bedsharing by the CJ Foundation for SIDS. 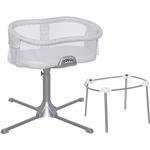 For babies up to five months or 20 pounds. Stop using when infant shows signs of pulling up, rolling over, pushing up to kneeling position. Side wall lowers so tending to your baby from bed is easy - Auto-return ensures that baby always sleeps safely. Locks in the upright position if desired. 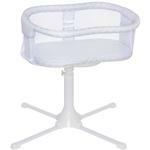 Rotates to make getting in and out of bed easy - Ideal for mothers who are recovering from c-sections and have limited mobility. Soothing made simple - Includes nightlight, 3 lullabies, 3 nature and womb sounds, 2 levels of vibration and nursing timer with auto shut off. Easy to see and easy to soothe - Baby is visible at eye level for easy soothing, while mesh walls provide maximum breathability. Stable base adjusts to fit most beds - Fits beds of 22 to 34 inches (56 to 86 centimeters) tall. Additional bassinest fitted sheets available - Cover the Bassinest mattress with HALOs custom hourglass-shaped fitted sheet - available in 100% cotton. A must have accessory item. The HALO Bassinets Swivel Sleepers custom mattress should be covered with this custom bassinet sheet. The sheet is designed to perfectly fit the hourglass-shaped mattress and features an envelope design for a secure fit. 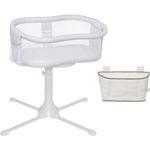 The HALO Bassinest Swivel Sleepers custom shaped mattress pad should be covered with this custom bassinet sheet! The sheet is designed to perfectly fit the mattress pad and features an envelope design for a secure fit. 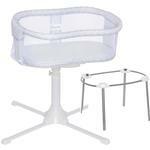 Plus, the hourglass shape perfectly fits the custom Bassinest Swivel Sleeper mattress. 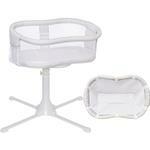 The Damask print coordinates perfectly with the Bassinest Safer envelope and design wont come loose during use. Machine washable. The Organic Cotton Mattress for the HALO Bassinets Swivel Sleeper is made from the finest non-toxic materials with the comfort and safety of little ones in mind. Its cover is made of 100% certified organic cotton fabric with a food-grade, water-resistant coating. Easy-to-clean and stain resistant, our Organic Cotton Mattress also provides a hypoallergenic dust mite barrier. 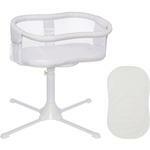 To provide the safe and comfortable support little ones need, uses NO flame retardants and emits NO harmful chemicals. 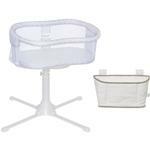 It does not use any vinyl or PVC, and is Phthalate-free. 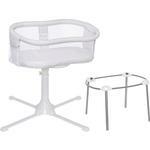 Made specifically to fit the HALO Bassinets Swivel Sleeper with its hourglass shape, it is an ideal safe sleep surface. This Bassinets Mobile is adorned with colorful plush toys that encourage eye-tracking at an early age. It comes with a sturdy clamp that attaches easily and securely to the HALO Bassinets Swivel Sleeper. 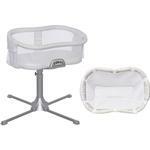 The Bassinets Storage Caddy easily attaches to the side of the Bassinets Swivel Sleeper to hold all of babys nighttime necessities. 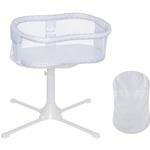 Holds babys bottle, diapers, wipes and more. 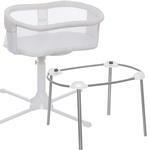 Plus, its simple and elegant design coordinate with all HALO Bassinets Swivel Sleepers. The HALO Bassinest Swivel Sleepers custom mattress should be covered with this custom bassinet sheet. The sheet is designed to perfectly fit the hourglass-shaped mattress and features an envelope design for a secure fit. Protect the HALO Bassinets mattress with this custom designed mattress pad from HALO. 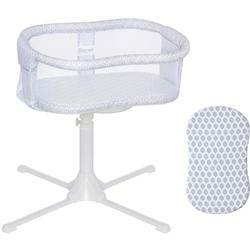 This mattress pad features an hourglass shape with envelope design to ensure a perfect and secure fit to the unique shape of the HALO Bassinets Swivel Sleeper mattress. Its triple layers of 100% polyester material ensure the pad is waterproof and help protect the mattress from leaks and odors. The HALO Bassinets Swivel Sleepers custom mattress should be covered with this custom bassinet sheet. The sheet is designed to perfectly fit the hourglass-shaped mattress and features an envelope design for a secure fit. Plus, its made from 100% certified organically-grown cotton that is free of dyes, softeners and finishes.